If you perused any fashion magazines this past summer, you probably saw the ad of Rihanna Wearing White Cut Off Cat Eye Sunglasses. In this particular ad, she's sporting the perfect curly short haircut which fits her face shape so nicely. Rihanna's White Cut Off Cat Eye Sunglasses are the perfect shades for the summer. They have a great high end look without all the flash that Oversized Sunglasses offer. They're petite shape is minimalist, which gives them even more of a high end look. Rihanna's White Cut Off Cat Eye Sunglasses are the perfect accessory to wear if you want to sport a low key but very cute outfit. Denim cut-offs, a cute white flowy tank, black Havaiana sandals, and a black Rebecca Minkoff sling are all you need to style with these sunglasses. 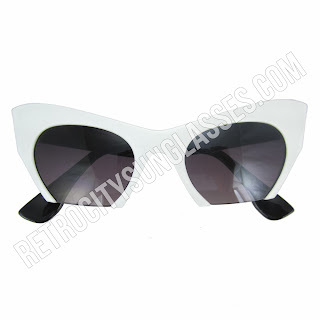 Buy Rihanna's White Cut Off Cat Eye Sunglasses at RetroCitySunglasses.com for $10.99 a pair.